My human pet said those sheets look wonderful. She's very envious of your Angie. Apparently, my human is one of those Bed, Bath, and Beyond wenches. I do hope, though, that you share with Beau Beau. That's too much comfort for just one cat. Don't be like Isis: Be nice to your brother. I know how you feel, Angie. I been snugglin' all I can lately. The cool weather makes me wanna cuddle! OH Angies yus make me wannna come join yu in a nap pile. Yu look so furry purrty in that comfy bed! Just like the princess wif da pea! An excellent idea, Angie. I think I'll prepare a winter "spot" for myself while there's still a lot to choose from! Since Victor has stolen the big bean bed, I've been makin my own nest in the boy's bed. It's messy, sure, but that helps me be difficult to see. It's definitely time to find warm places to nap. Hi, purty Angie! That's a good cat spot; I like my Mom an Dad's bed, too. Is Beau Beau back to cat-hood? I's worried bout him bein a ghosty. Maybe if you let him warm up on the bed, he'll return to normal. You look very comfy and warm! Can I join you? That looks very toasty and comfy. Mrs. B will spend all winter in her cat-cup in front of the heater. That looks very comfortable. I can be found in similar circumstances - until March or so. I prefer the colder weather. I get more active and I enjoy snuggling down to sleep. That looks like a fantastic place to sleep. 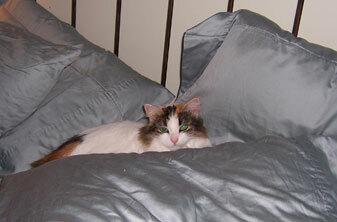 I have a similar place on Mom and Dad's bed, but their bedding isn't nearly as fancy. Mom says the sheets look better than they feels. They still feels purty good to me tho. Purrrr. Maybe the next time the beans go away we'll haf a big gigantic nap pile! Oh, you looks so nice and comfy! Who cares about the cold? That just means it's snuggly time! That bed looks really really comfy! I wish it were warmer, I don't like the cold at all. oh yoo do look luvly an cumfy theer. That looks like a furry nice bed to snuggle on. White stuff fell from the sky, so we know it is winter now. Time to cuddle till spring.